What types of audio transformers exist? In a step-up / step-down transformer, the primary and secondary have a different number of windings, thus they have different impedances. Different impedances cause the signal level to change as it goes through the transformer. If the secondary has a higher impedance (more windings) than the primary, the signal level at the secondary will be a higher voltage than at the primary. A transformer with multiple taps provides access to multiple impedances and to different signal gains or losses. Often called an isolation transformer, it has the same number of windings on each coil. As the impedance is identical for the primary and secondary, the signal level does not change. A unity transformer allows an audio signal to pass unmodified from the primary to the secondary while blocking DC voltage and radio frequency interference (RFI). Also, since the primary and secondary are insulated from each other, a unity transformer will electrically isolate different pieces of equipment. This can solve hum problems by isolating ("lifting") the grounds of different devices. 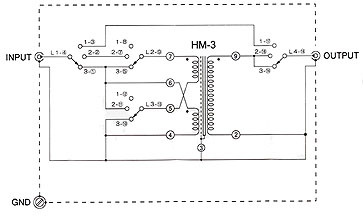 The function of a step-up transformer is to raise the output of the MC cartridge in order to be correctly handled by a Moving Magnet phono section. 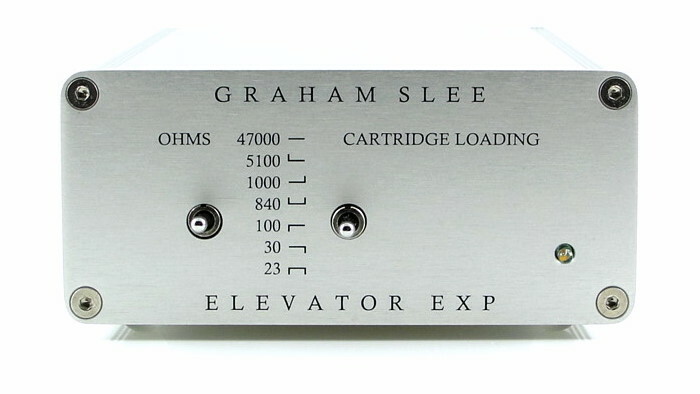 At the same time, the step-up transformer adapts the impedance of the signal produced by the MC cartridge to an impedance that can be "seen" by your Moving Magnet input. For this reason, check the compatibility of your MC / step-up combo. Most of the time, if the sound isn't good it's because of a compatibility problem. If a step-up has a gain of 1:10, this means that the output of the cartridge will be multiplied by 10. If the output out of the cartridge is 0.3 mV, you'll have, after the step-up, 3 mV, perfect for a Moving Magnet input. The Moving Magnet input has its own impedance generally equal to 47 Kohms. The signal emitted by the MC cartridge must be in accordance to that 47 Kohms. A step-up modifies the impedance of the output by a factor equal to the square of the amplification ratio. This is known as "natural impedance". (if your Moving Magnet input impedance is 47 kohms: 470 = 47000/102). For one channel, there are two coils: a primary (the 'input': for the signal emitted by the cartridge) and a secondary (the 'ouput': the amplified signal will go out to your Moving Magnet amplifier stage). You will see that there are less turns on the secondary than on the primary. This is not a strange idea from the designer of this scheme. Your amplification ratio is a direct result of the turns ratio (primary/secondary). This explains why, on a step-up that can be used with several internal impedances cartridges, the gain differs according to the internal impedance you're selecting. Never try to check the windings with an ordinary multimeter. The DC-current of the meter will magnetise the core! the grounding of the step-up. If you're having grounding problems, or shielding problems, you'll probably have "hum". Which Step-Up Transformer for my cartridge? The Moving Magnet input has its own impedance generally equal to 47 Kohms. The signal emitted by the MC cartridge must be in accordance to that 47 Kohms. A step-up modifies the impedance of the output by a factor equal to the square of the amplification ratio. This is known as "natural impedance". Calculate the loading your cartridge sees. Resistor tuning is a way to modify (to lower) the reflected load impedance directly linked to the gain of your step-up transformer. You can lower the load impedance by adding a resistor between the + and the - of the RCA plug (out of the step-up). Suppose you have a 1:10 gain step-up. Your actual load impedance is 470 ohms (natural impedance). You would like to test a load impedance of 100 ohms. By adding a resistor, you're modifying the impedance of the Moving Magnet input (actually equal to 47 000 ohms - standard). to change the loading to a desired value? Note, you can only go lower in value, not higher (negative answer means unrealizable). You have a Moving Coil Cartride with 0.5 mV output and you would like to obtain 5 mV in your Moving Magnet Phono Amplifier input, so you need a 1:10 transformer. You would like to have a load impedance of 40 ohms. Enter Rload to calculate the two required resistors values you need.